A sweeping, epic saga of romance and hardship, set against the dramatic backdrop of ancient Mesopotamia—perfect for fans of Cleopatra's Moon or the adult bestseller The Red Tent.In the unforgiving Mesopotamian desert where Jayden's tribe lives, betrothal celebrations abound, and tonight it is Jayden's turn to be honored. But while this union with Horeb, the son of her tribe's leader, will bring a life of riches and restore her family's position within the tribe, it will come at the price of Jayden's heart.Then a shadowy boy from the Southern Lands appears. Handsome and mysterious, Kadesh fills Jayden's heart with a passion she never knew possible. But with Horeb's increasingly violent threats haunting Jayden's every move, she knows she must find a way to escape—or die trying.With a forbidden romance blossoming in her heart and her family's survival on the line, Jayden must finish the deadly journey to save the ones she loves—and find true love for herself. Enter the tour wide giveaway, and then keep reading to see my review of FORBIDDEN! I am thrilled to participate in the blog tour for FORBIDDEN. This fascinating historical journey is full of intricately detailed customs and traditions, mesmerizing romance, and the fight for survival. This book includes many historical references, such as King Hammurabi, the Queen of Sheba, the Temple of Ashtoreth, and other interesting world building details for the Ancient Mesopotamian setting. While desert settings are never my favorite (I’m not a fan of the constant search for water), FORBIDDEN is beautifully and believable crafted, and I loved not only the story by the writing style as well. The main characters are nomadic, living and traveling in the desert, and their lives are filled with fascinating traditions. Jayden, our main heroine, is at a time in her life when she’s forced to live through unimaginable tragedy, and she wants a different life than the one she’s got, though she doesn’t know exactly what that different life looks like. She struggles with her betrothal to a man she doesn’t love (and shouldn’t since he’s a terrible human being), and then she feels guilty for falling in love with someone who actually loves her back. Kadesh, Jayden’s mysterious new love who shows up out of the blue, wounded and in desperate need of help, is almost too perfect. He’s kind, smart, rich, handsome, sensitive, a good fighter…I’m interested to see if some faults or failures appear out of the mist in the second book since he seems rather too good to be true. But if you’re looking for swoon worthy heroes, Kadesh is your man. I have read reviews that hated the dancing (Jayden’s tribe dances for everything- childbirth, marriage, rain…everything), and I can see where they are coming from, but I actually found it to be an interested plot device. Jayden’s tribe uses dance as a positive custom, performing for certain hoped-for outcomes such as strength or peace. But as a parallel, the author has placed the sensual and promiscuous priestesses of Ashtoreth on the opposite end of the spectrum; they also dance, but it is considered wild and wicked. I thought this was a rather clever juxtaposition, and created conflict in Jayden’s heart about her own dancing. All in all, FORBIDDEN is a lovely read, and I didn’t want to put it down. 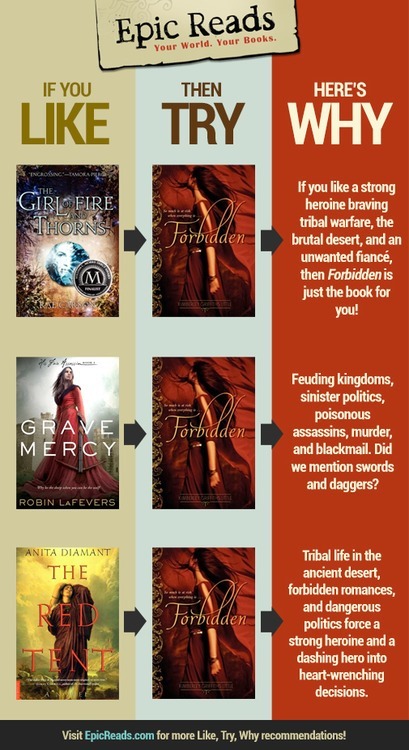 This is great for fans of The Girl of Fire and Thorns by Rae Carson, and Fire Country by David Estes. This entry was posted in Book Reviews and tagged Action, Historical, Romance, YA.